Members of the Scalable Parallel Computing Laboratory (SPCL) perform research in all areas of scalable computing. The research areas include scalable high-performance networks and protocols, middleware, operating system and runtime systems, parallel programming languages, support, and constructs, storage, and scalable data access. The SPCL group has several active research projects, many in collaboration with industry, other academic institutions, and high-performance computing centers world-wide. 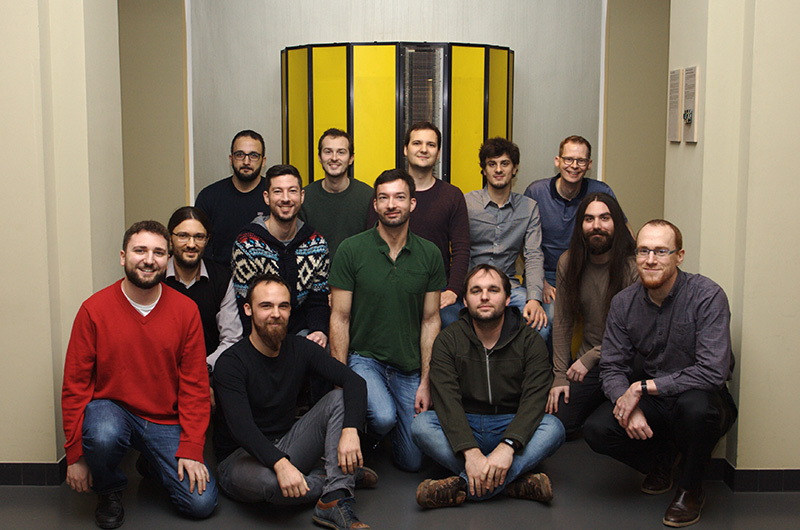 SPCL group and ETH's Cray-1, January 2018. Left-to-right, top-to-bottom: Salvatore, Johannes, Konstantin, Niels, and Tobias Gysi (back row), Maciej, Alexandros, Timo, Theodoros (middle row), Tal, Grzegorz, Tobias Grosser, and Torsten (front row). The SPCL group is always looking for highly qualified students at all levels. Student projects in the form of "Semesterarbeiten" and "Master-/ Diplomarbeiten" for ETH students are available in many different areas. Highly qualified students looking for a HiWi (assistant) research job are also encouraged to contact Torsten Hoefler. The group is also looking for outstanding Ph.D. students who are interested to pursue research in the areas of performance and scalable parallel computing. Postdoctoral researcher positions may also be available for candidates with an excellent academic track record. Refer to the SPCL Jobs page for details. If you are interested in SPCL's activities, you can subscribe to our SPCL-friends mailinglist where we announce group talks and open meetings. For example, our weekly group meeting (usually on Tuesdays) is announced there.